The Doctor's Orders gift basket brings all kinds of treats sure to beat the blues or the blahs. Gummy band aides, get well pills, Get well fortune cookies and ceramic mug, plus giant aspirin and Too Pooped to Pop popcorn will amuse you and cure what ails you. 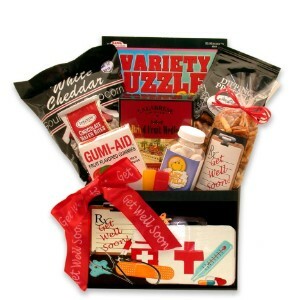 When someone you know needs to feel better, send the Doctors Orders gift basket, available in two sizes.